Shiel Bridge is a legendary place among mountaineers, and anybody with aspirations to stand astride the most handsome mountains in Scotland will eventually find themselves in Glen Shiel, staring up at the famous Five Sisters of Kintail or contemplating the steep and slightly perilous ascent of the mighty Forcan Ridge on to the Saddle. 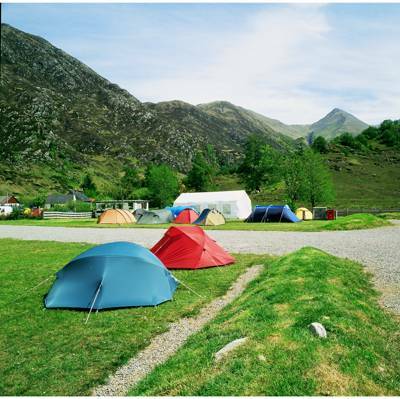 The campsite lies in the deep crevice of Glen Shiel, surrounded by these monsters, and it’s fair to say that the view from your tent, in all directions, is of steep rock walls heading skywards. It’s a mesmerising place to just sit and stare, without even putting a single foot on the hills. It’s a place for dedicated hill-folk, certainly, but hills are only half the story here, because this is a startlingly good area for more generalised exploration. Besides all those big, brave hills there are plenty of local, lower-level walks, notably the track up Glen Lichd (it goes on and on, with the only limit being your own), or the path over to Glen More on the Glenelg Peninsula, and back via the Mam Ratagan Pass. Still on an active theme, cyclists have ample opportunities to pedal through terrain varying from the near flat lochside lane on the western side of Loch Duich to a marathon push over to Glenelg and back. Another tremendous on-road biking route takes you around Loch Duich and Loch Long, then up Glen Elchaig to examine the Falls of Glomach which, after heavy rain, are awesome. In truth, the off-road and on-road biking opportunities around Glen Shiel, Glenelg and Loch Duich are almost as endless as the walking routes. If you’re not a hill-walking superhero, what has Shiel Bridge got to offer holidaymakers who aren’t so keen on a hamstring hammering? Loads, is the answer. The Glenelg Peninsula is one of the least spoilt and least trodden places in Scotland, and stunningly beautiful, to boot. At Sandaig, you’ll find the location where author Gavin Maxwell lived with his otters and wrote the definitive story of solitary life in the Highlands, Ring of Bright Water. Then there are the wider attractions of Skye, with a distillery to visit, more waterfalls to gaze at, boat trips galore and, for general touring, the whole of Wester Ross to explore. That very icon of Scottish scenes, Eilean Donan Castle, lies a few easy pedalling miles along the loch shore, too, but expect to share it with every nationality under the sun, such is this magnificent place’s celebrity status on the international tourist circuit. For a really great day by bike or car, go over the Mam Ratagan Pass, board the tiny car ferry to Skye then meander back through Skye to Kyle of Lochalsh, returning via the (now free) road bridge. A very different kind of journey can be taken on the railway from Kyle of Lochalsh to Inverness, as the train threads its way through one of Europe’s most handsome and empty landscapes before arriving in the not-so-big city. If the weather were consistently kinder, all these attractions would make Shiel Bridge the Holy Grail of holidaying places. The site itself is ever so civilised, with excellent shower and washing facilities, the provision of electric hook-ups and a decent food shop next door. But as at all campsites on the west coast of Scotland, midge protection measures need to be thorough. So, while the atmosphere on the site reeks distinctly of all things mountaineery, it would be unfair to cast the place in such a singular role; Shiel Bridge is just as good as a scenic base-camp as it is as a home for climbing heroes. That said, just see if you can resist the lure of those hills. We stayed here for one night en route to the Western Isles. It was only later that I discovered it was listed in Cool Camping. As tent campers we found it very disappointing. There is not much space for tents, just a strip either side of the entrance road. The rest of the site is hard standing for vans. The ground is not well drained so during our July stay tents had to cluster together to avoid the puddles. I'm sure it's fine for caravans and camper vans though. The toilet block was clean but the ladies' showers didn't work properly (one had no curtain, the other had a dodgy switch supplying intermittent cold/hot water). The shop was well stocked with sweets and snacks but little real food. 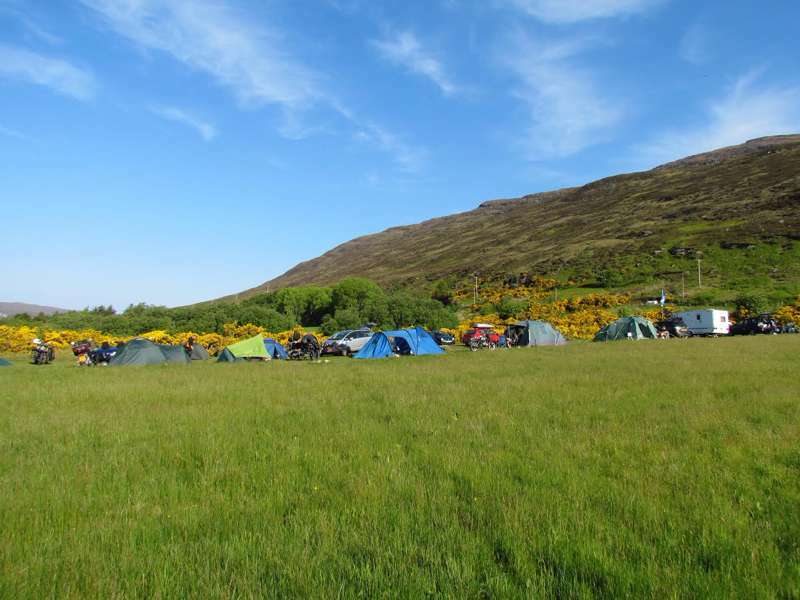 There are great views of the hills and the nearby hotel offers very good food and Skye Brewery beer. We stayed here for 1.5 nights over the May bank holiday weekend! We had hiked the 5 Sisters of Kintail on the Saturday, the weather was glorious and the walk was amazing. Unfortunately that night though the wind really picked up - so much so that despite having had a strenuous hike for over 10 hours I could not sleep a wink as I was worried our tent was going to blow away. Unfortunately at about 4:30am our tent broke, the main pole snapped and the pegs tore away from the tent too... so unfortunately this campsite was the death of our tent. I'd like to point out that this tent wasn't a cheap one and it had survived Durness before which was a serious test of the wind too! The wind was extremly strong on the Saturday but I do think this campsite could maybe benefit from some shrubs or something to act as a wind break (also would help with prvacy??) The facilities at the campsite were clean but basic. There were only 2 toilets and shower for the ladies. We were there at the beginning of May so the campsite wasn't too busy so this wasn't an issue but I imagine during the peak season there might be some queues for the loos! The rating of 3 stars is for the amazing location and also for the facilities. I stayed at Shiel Bridge in middle of August 2013 for one night and while I rate the area as one of the most scenic in Scotland, the site itself is in dire need of upgrading. The ground was very uneven and given the recent rain, many parts were saturated with water pools lying. This of course is a perfect environment for the midge and there were plenty of those around. The toilets facilities are OK with 2 showers etc as described in the information but modern they are not and and are in dire need of a good deep clean. Only one of the men's showers had a curtain and the other looked like it needed a good washing. On the positive side the shop is very handy for essentials but as with most rural shops prices tend to be higher that in the main population areas. Modern and comprehensive, with toilets, showers (2 apiece), washbasins and electric hook-ups. There’s also a shop and petrol station where you book in, selling most essentials so you can stock up while you reserve your pitch. The ferry across to Skye is run by the residents of Glenelg, and is a thoroughly crazy (but practical) little contraption, so take a trip across the water on it. Otherwise, the only accessible attractions are back out over that steep narrow road. Eilean Donan Castle (01599 555202) is 12 miles away. Further up the valley from the campsite, though not necessarily wet-weather attractions, the Glenelg Brochs (world-famous Iron Age fortified ruins) are nonetheless worth a visit. The rather splendidly situated Kintail Lodge Hotel (01599 511275) is a half-mile walk from the site, overlooking Loch Duich. It serves decent bar meals and also has a good restaurant serving up a host of local seafood and game. Adults £5; children £2.50. A family of 4 (2 adults, 2 children) costs £12.50 per night. Camper vans and caravans cost £15. Dogs are welcome (free of charge), on the condition that they are well behaved. Nice and easy. The site is situated just off the A87(T) Kyle of Lochalsh road behind the shop at Shiel Bridge. Scottish Citylink (08705 505050) runs the no. 915 bus from Fort William to Shiel Bridge Junction. The bus journey takes about an hour and a half, but it’s then only a 2-minute walk to the site.